Source: Find A Grave website. 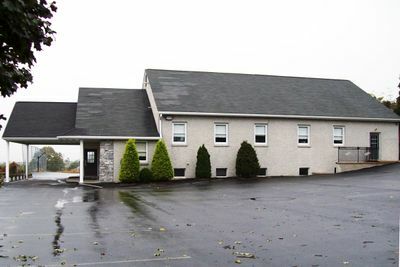 Summitview Christian Fellowship in New Holland, Pennsylvania, USA was established in 1968. The church originated in events that occurred several years earlier. In July 1964 the Old Order Amish Church asked its church members to terminate the use of forage harvestors, combines, electric generators, and barn cleaners. Many Amish farmers had invested heavily in this type of equipment, and chose not to abide by the request. In the end, approximately 30 families met on 6 February 1966 as a new group. At first the group met in homes and in a rented school. In 1969 a meetinghouse was completed and called Summitview Amish Church. At first the church identified as part of the New Order Amish. Eventually the church identified as an Amish Mennonite church. The church's first minister was Reuben Smucker, ordained as Minister on 30 October 1966 and the church's Bishop on 13 April 1969. Leroy E. Lapp was ordained as Bishop on 1 June 1986. The church is the mother church of several congregations: Bethel Christian Fellowship, Gap View Mennonite Church, Shaver’s Creek Fellowship, Shade Mountain Christian Fellowship, Spring Garden Church, and West Haven Amish Mennonite Church. In 2018 the church was a member of the Maranatha Amish Mennonite Church and had 165 members. David K. Stoltzfus served as bishop and was assisted by Deacon David Lapp and Minister Jonas B. Stoltzfus. The Beachy Amish-Mennonites. "Amish-Mennonite Churches in Pennsylvania." Web. 6 December 2013. http://www.beachyam.org/churches/pa.htm. Mennonite Church Directory (2013): 81; (2018): 92. Yoder, Elmer S. The Beachy Amish Mennonite Fellowship Churches. Hartville, OH: Diakonia Ministries, 1987: 354-355. Thiessen, Richard D. "Summitview Christian Fellowship (New Holland, Pennsylvania, USA)." Global Anabaptist Mennonite Encyclopedia Online. April 2018. Web. 26 Apr 2019. http://gameo.org/index.php?title=Summitview_Christian_Fellowship_(New_Holland,_Pennsylvania,_USA)&oldid=160359. Thiessen, Richard D. (April 2018). Summitview Christian Fellowship (New Holland, Pennsylvania, USA). Global Anabaptist Mennonite Encyclopedia Online. Retrieved 26 April 2019, from http://gameo.org/index.php?title=Summitview_Christian_Fellowship_(New_Holland,_Pennsylvania,_USA)&oldid=160359. This page was last modified on 10 April 2018, at 17:43.